Conservation Photography allows me to integrate my artistic and scientific practices, my desire to explore and document wild natural spaces, and my passion for teaching others about the wonders of the living parts of the natural world. My ultimate goal is to inspire people, both young and old, across all cultures and disciplines, to act in some way -- whatever way they can -- to protect and conserve biodiversity, our most precious resource. All of the photos on this site were taken with a point-and-shoot camera (either Fujifilm FinePix S1, Nikon Coolpix AW110, or Canon PowerShot SX200 IS), in natural lighting. Occasionally I've applied a filter to the image, and I've indicated this in the caption. In 1995 I began photographing the rain forest in Costa Rica with a Pentax K1000 SLR film camera. I switched to digital point-and-shoots for convenience when I began trekking into the Amazon rain forest with a course-full of students and my children. I would not have gotten most of these shots if I had to carry around a bulky camera bag and worry about changing lenses. Even at home in Ontario I often have only seconds from the time I spot an animal until it is gone. As anyone knows who photographs wild animals, they don't stick around for very long. For now, point-and-shoot cameras serve me well. Conserving biodiversity is fun and rewarding, and you can do it in your own backyard. Get inspired, and become a conservationist! Check out my educational website where you can read more about me, my conservation work, and how to conserve biodiversity on your property by planting native plants. If you want to contact me, you will find a contact form there. The Andean cloud forests are a part of the upper reaches of the Amazon river system and rain forest. These tropical montane forests are as species-rich as they are beautiful, and provide endless opportunities for photography. The images were taken in Napo Province, Ecuador, at various locations in the region surrounding the town of Cosanga, ~ 2200-2400 meters elevation on the eastern slopes of the Andes. Many of the images were taken on the grounds of the lodge called Cabañas San Isidro, and down the road at Yanayacu Biological Station & Center for Creative Studies. The images of moths (and other insects) on white cloth were taken at a light trap. The night before the images were taken the moths were lured to a white sheet with a bright light. Artificial light confuses moths that navigate by the moon, causing them to spiral inward to the source. Once they reach the light they assume their diurnal roosting behaviour. It's a trap, but it allows one to study nocturnal insects up-close, without harming them. Scientific names of birds follow "Fieldbook of the Birds of Ecuador" by McMullan and Navarrese, 2013. Images were taken in Peru, from Iquitos upstream to deep into the Pacaya-Samiria Reserve, and in Yasuni Biosphere Reserve, Ecuador. In Ecuador our base in Yasuni was the Shiripuno Lodge and Research Centre on the Shiripuno River. Most of the images from Peru, and some from Ecuador were taken while I was in a moving vehicle -- a small boat -- on a tributary of the Amazon. Native plants are beautiful, and essential to healthy ecosystems, yet misconceptions and negative attitudes towards them persist in our culture. Their common names often contain the word "weed" but they are the plants that evolved naturally in North America. They were here long before Europeans arrived, and many species are now at risk of extinction due to habitat loss and over-harvesting. Most of the images were taken in our biodiversity garden in southwestern Ontario, and some were taken in natural areas nearby. As you learn about native plants, be sure to confirm scientific names; often introduced alien plants look similar to native species. Native plants and the variety of animals they attract are the subject of this gallery. All of the Images were taken in our biodiversity garden in Ontario. Get inspired to plant native plants on your own property. If you love animals of all sorts, native plants will attract, feed and shelter far more kinds of animals than typical non-native garden plants. Images of North American species and habitats. Most of the images were taken in southwestern Ontario, a tiny portion of Canada. A part of the Eastern Deciduous Forest Biome, it contains tremendous biodiversity. Several images were taken at the beautiful Delaware seashore on the Atlantic coast, USA. 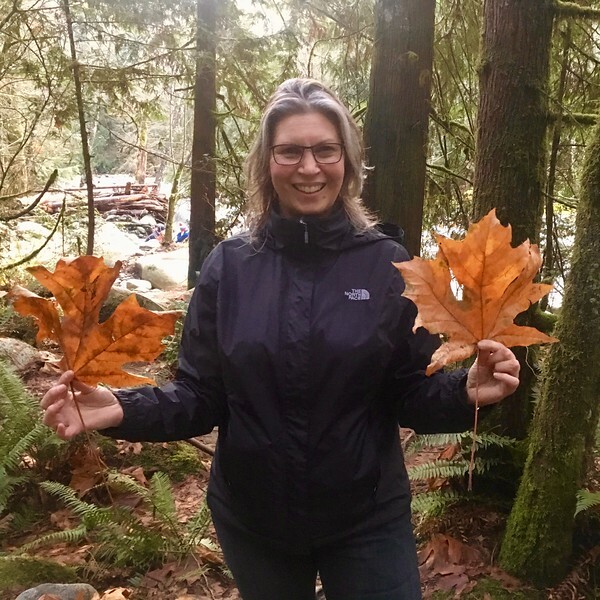 Nina holding leaves of Bigleaf maple (Acer macrophyllum) in Vancouver, Canada, November 2018. Photo by Dr. Holly Martinson.